The Cardinals would return to Omaha in 2014, this time with Funkhouser as their ace. Though cruising to a 13-3, 1.95 ERA season with a K/9 of 9.15, the Funkhouser and the Cardinals were still ousted in two consecutive games in Omaha. Starting the opening game against eventual champion Vanderbilt, Funkhouser’s final line was 6IP 6H 4R 4ER 6BB 5K, taking the loss. After a strong summer following his sophomore year in which he posted a 36:8 strikeout to walk ratio in 28.1 innings for Team USA’s Collegate National Team, Funkhouser entered his junior campaign as a candidate to go first overall in the 2015 draft. While Funkhouser cut his BB/9 rate from 4.86 in 2014 to 3.84 in 2015, his H/9 has jumped from 6.36 to 7.87. Funkhouser’s K/9 rate also showed some regression, going from 9.12 in 2014, to 8.33 in 2015. That regression contributed to Funkhouser sliding until the 35th overall pick in the draft when the Los Angeles Dodgers selected him. The Dodgers were unable to reach an agreement with Funkhouser despite an offer that was reportedly somewhere between $1.75 million (slot value) and $2 million. Fastball: The first time I was able to see Funkhouser, he sat sat 90-91 mph for the first few innings, but once he loosened up on a cold February day, he worked at 93-94 mph in the middle innings. More recently, he was able to maintain his velocity at 91-93 mph until the 8th inning when he dipped slightly to 89-90 mph. While he doesn’t command the pitch particularly well, his misses were still in the zone. The fastball was straight when I saw him last year. The iteration I saw this season flashed some arm side run so he may have been playing around with a 2-seemer. 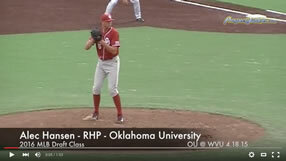 Slider: The most effective out-pitch throughout his college career, Funkhouser’s slider sits 78-82 mph with good tilt. Changeup: A rarely used offering the first time I saw Funkhouser, he showed a much improved feel during the most recent outing. Coming in at 82-85 mph with good fade, Funkhouser pivoted the changeup off the fastball to keep the Notre Dame hitters off balance. Funkhouser clearly showed confidence in his changeup, often calling off his catcher in favor of this pitch. The only significantly hard hit ball of the day, however, came off a changeup that Funkhouser left up in the zone to Irish slugger Zak Kutsulis. The mistake got deposited over the right-center field fence. DELIVERY: Funkhouser’s strong frame and quick arm action generate easy velocity. Funkhouser maintains balance throughout his windup which contributes to his ability to repeat his delivery. Pitching from a downhill plain with a high 3/4 delivery, Funkhouser seems to lose his release point at times, leading to control and command issues. For a big man, Funkhouser fields his position well. From the stretch, he’s in the 1.25-1.35 second range to home plate which shouldn’t make him particularly susceptible to teams running on him. FUTURE: Funkhouser is no longer regarded as the top 5 overall prospect he was entering 2015, and scouts that I’ve spoken to have questioned whether turning down the bonus the Dodgers offered last season was a mistake. This year’s draft contains a deeper class of college pitching from which Funkhouser will need to separate himself. Returning to school was a gamble on himself and the Boras Corp, Funkhouser’s representation, has a track record for success. Once selected and signed, I see Funkhouser as a mid-rotation innings eater and a safe bet to be a major leaguer if he can refine his command in the minor leagues. DISCLAIMER: It’s important to note that I’m not a scout. I do, however, actually go to see these guys play live, which is more than you’ll get from many online “Scouting Reports”. I also talk to scouts when I’m there. While scouts reserve their reports for their employer, I can share my thoughts with you, the reader.